Varanopseidae: Relatively small (~1 m), lizard-like, basal carnivorous (piscivorous? insectivorous?) eupelycosaurs, resembling monitor lizards. upC-upP(mP?) of NAm, Eur. & Afr. Eupelycosauria: Ophiacodontidae + (Edaphosauridae + Sphenacodontia)) + *: Mycterosaurinae + Varanodontinae. Introduction: Of all the pelycosaurs, the varanopseids in appearance most resemble large modern varanid (monitor) lizards. None developed the distinctive sail that distinguished many pelycosaur groups. All are of small to medium size (none more than about 1.5 meters), with slender, lightly built skulls and a slender, very typically lizard-like body, fairly slender limbs, and a long tail. In fact, we might say that the varanopseids were lizardlike in its general aspect, though this must not be taken as an indication of any close relationships with the lizards. In the skull Varanosaurus showed certain specializations that were the beginnings of some definite evolutionary trends typical of the more advanced pelycosaurs. For instance, the skull was rather narrow, deep, and elongated, with the eyes set far back. The jaws were very long, and the teeth were numerous and sharp. There was no indication of an otic notch (to support an eardrum), and the ear was located in the vicinity of the jaw articulation. Varanopseids retain several primitive skull and skeletal features that indicate they are more primitive than other Pelycosaurs apart from the Eothyrids. For this reason modern cladistic paleontogists reject the opinions of earlier workers like Romer and Price (1940) who associated varanopseids with the advanced sphenacodontid family, and even suggested that Varanops, may have been closed to the ancestry of sphenacodontids. The most recent hypothesis places varanopseids within the Eupelycosauria, as its most primitive member, and close to the ancestral linneage from which the more advanced ophiacodontids, edaphosaurs, and sphenacodontids evolved. Unfortunately the evidence of the fossil record contradicts this hypothesis. All of the really early pelycosaurs belong to the supposedly advanced ophiacodontid family. Rather then erect numerous "ghost lineages" to fill in the gaps, I would suggest instead that the Varanopseids, like the Eothyrids represent a secondarily primitive lineage that had lost certain specialised features. It is likely that both these groups evolved from Ophaicodontids during the great drought of the Kasimovian epoch, when the long period of aridity proved favourable to the reptiles, and not so good for the big basal tetrapods of the coal swamps. No doubt future discoveries will no doubt determine which theory is the correct one. Characters: Compared to other pelycosaurs, sleek and streamlined [R+97]; skull deep and narrow, with relatively short antorbital region [RP40]; snout slender [RP40]; premaxilla with strong, deep maxillary process [R+97]; premaxilla maxillary process dorsolateral surface broad, smooth & gently curved [R+97]; premaxilla with shallow groove terminating in crescent-shaped depression (for nares) [R+97]; maxillae lengthened; lacrimal reaches nares (? ); medial and orbital margins of frontal raised [R+98]; $ parietals with medial anterior process bordered laterally by frontals and reaching level of orbit [R+98]; narrow zygomatic arch (implies possible primitive development of masseter muscle for chewing) [DR96]; maxilla contacts quadratojugal [DR96] and may exclude jugal from skull margin; lacrimal reaches nares [RP40]; orbits frontated (dorsal margin concave) [RP40]; slender posterolateral process of frontal [DR96]; in some, postfrontal may be reduced, and squamosal may have long anterodorsal process reaching dorsal process of jugal, excluding postorbital from temporal fenestra; $ tuberous ornamentation on jugal, postorbital & prefrontal [R+98]; bars under orbit & fenestra usually very slender; suborbital and temporal fenestra usually large and $ always tall, $ bordered ventrally by thin bar from jugal, quadratojugal, with small maxillary contribution [DR96] [R+98]; occipital flange of squamosal reduced [DR96]; pineal foramen large & located near posterior end of skull table [DR96]; postparietals paired; tabulars slender [R+98]; otic notch absent; occiput concave in dorsal view [RP40]; plate-like occiput from supraoccipital fused to paroccipital processes; occiput may be strongly slanted forward; parasphenoid plate with large posterolateral wings [R+97]; quadrate and pterygoid floor middle ear cavity [R+97]; basisphenoid with large, laterally extended, tapering, pointed tubera [R+97]; jaw articulation posterior of occiput [RP40]; toothed area of premaxillae expanded; maxilla with longer posterior tooth row; dentary slender [M+01]; $ marginal dentition strongly recurved [DR96] [R+97] [R+98]; $ teeth mediolaterally flattened [DR96] [R+98] (contra [RP40]) with both anterior and posterior cutting edges formed by tapering not ridges) [R+97]; teeth with slight lingual curvature at end [R+97]; tooth row horizontal & at same level as jaw articulation [RP40]; canines poorly developed [RP40]; elongate hyoid elements extending far behind skull [DR96]; ventral keel on vertebrae not much developed [RP40]; transverse processes short [RP40]; dorsal zygapophyses more lateral than in sphenacodonts and articular surfaces more horizontal [RP40]; neural spines short [RP40]; 2 sacral vertebrae [RP40]; deltopectoral crest in two parts, each with rugosity for muscle attachment [R+97]; proximal head of humerus relatively small (width 1/3 total humerus length) [R+97]; distal end width <50% humerus length [R+97]; ilac blade "low" ?) [RP40]; hind legs markedly longer than forelimbs [RP40]. Links: Paleontology and Geology Glossary: V; Synapsid classification and autapomorphies; Anatomy and relationships of Elliotsmithia; Biology 356; Synapsida; Schnellbestimmung anhand von typischen Schädelmerkmalen (German). Image: Mesenosaurus romeri courtesy mathematical.com. Earliest fossil synapsid group. Note that this is not the best example, as some of the features mentioned above are not visible or simply not present. 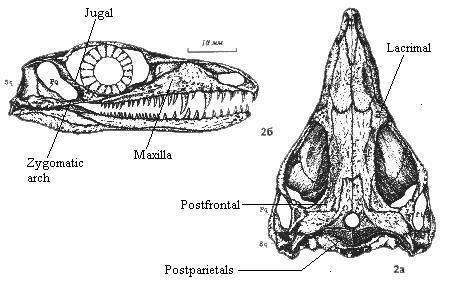 Here, and in some other varanopseids, the posterior process of the maxilla passes under a small shelf created by the jugal and quadratojugal in the zygomatic arch. Thus, in this specimen, the maxilla and quadratojugal may well articulate, but do not exclude the jugal from the skull margin. Similarly, the lacrimal does contact the narial margin, as can be seen in the dorsal view. Note:  for detail of premaxilla, see Mycterosaurus. As always, Romer's observations are of great value, but have to be understood in their context. Romer & Price erected the Varanopsidae in [RP40], believing it to be a grade of pelycosaur intermediate between ophiacodonts and sphenacodonts. Notwithstanding, their suppositions about what should go into this new box were startlingly correct, including Varanops, Aerosaurus, Elliotsmithia, and Mesenosaurus similar to Mycterosaurus). This prediction, in 1940, is all the more incredible when one realizes that Romer & Price had only Broom's (1937) partial description of Aerosaurus and a few paragraphs on the fairly scrappy Mesenosaurus by Efremov the same year. Romer & Price conceive of the Varanopseids as being cranially like ophiacodonts (i.e., primitive) but post-cranially like sphenacodonts. This perspective caused them to make what appear to be errors in the polarity of certain character states, particularly in their description of Varanops. 011227. Discussion: The varanopseids have been treated here with unusual attention to detail and to intergeneric variation. For the most part, these Notes are concerned with events at the family level and above. There are a number of reasons for this, not the least of which is the expense and effort required to run through the tangled mass of literature with so fine a comb. However, certain taxa are close to high order nodes of unusual interest, and the varanopseids are one of those. Some time in the middle of the Carboniferous, perhaps 320 Mya or a bit more, the amniotes evolved. Almost immediately, they split into at least five important lineages: Eureptilia lizard, snake, dinosaur, croc & bird ancestors), turtles, the pareiasaur group (which may have included the turtles), bolosaurs, and our own Synapsida. Three of these groups survive today, of which two are clearly dominant. Almost all other tetrapods were eliminated except for the temnospondyls, who hung on until the late Mesozoic, and the Lissamphibia (frogs, salamanders & caecilians) who survived by radical re-engineering of their body plan. Unfortunately, so poor is the fossil record of the Carboniferous, that we know almost nothing about the early history of these new groups. The best we can normally do is to look closely at their descendants in the Permian and extrapolate backward. The Varanopseids, as relatively primitive synapsids, can tell us at least a few things about the development of this branch -- an important one to us personally. For example, they clearly show that the development of the slanted occiput was not a result of, nor even coincident with, the curved jaw line of later sphenacodonts and therapsids. The varanopseids had, for the most part, jaws as straight as a ruler. In fact, the slanted occiput came first. As Romer & Price (1940) observed, the skulls can be derived from the basic amniote pattern "as if one had kept hold of the animal's braincase and violently pushed the rest of the head toward the chest." That is, the top of the skull wasn't angled forward so much as the jaw was pushed back past the end of the skull table, forcing the occiput to slant. In retrospect, this makes good sense. By angling the head over the jaws, the jaw adductors could act more vertically on the jaw, and attach to the jaw at a point further forward, creating a far better mechanical advantage. Of course, the same effect could be achieved by changing the outline of the jaw to curve upwards, and this is what the sphenacodonts achieved. However, the brutally simple solution adopted by the Varanopseids seems to have been the first step. Like most feats of biological engineering, this solution created its own problems. For example, it made for a very flat skull. The slanting occiput actually reduces the volume available for the jaw muscles as it increases their mechanical advantage. One solution might be to develop a wider skull. However, the basal synapsid skull may depend for its structural integrity on the strong central arch of the skull table bones. See the discussion of Eothyrididae. Broadening the skull would leave the lateral margins without support and extremely vulnerable to lateral impact. Undoubtedly this was already a problem for varanopseids, with their thin, fragile bars of bone under the orbit and temporal fenestra. The eothyrids seem to have attempted a wider skull, but do not seem to have much success with it. If nothing else, the temnospondyls had been at the big-mouth flat-head game for quite a long time and would not be easily muscled out of that territory by bunch of retrofitted amniote newcomers. Another approach might be to increase the size of the temporal fenestra to accommodate more muscle. Yet another, to get bigger, since muscle volume would increase faster than jaw mass. Both of these trends can be found within the varanopseids. Unfortunately, the slanting occiput also restricts the degree to which the temporal fenestra can be expanded. However, there is no doubt that the more derived varanopseids were both larger and more fenestrated than their ancestors. With the benefit of hindsight , it seems obvious that the curved jaw of the sphenacodonts was the way to survival. However, let us not forget that all this could not have been obvious to a hypothetical young synapsid contemplating a career choice in the Carboniferous. A curved jaw means that one's teeth do not necessarily occlude at the same time, allowing a potential lunch to escape with only a nick. It calls for dental specializations to a degree unheard of in the Carboniferous, as well as a new set of more horizontally-oriented muscles to make the thing really work right, as well as a heavy, almost unwieldy, jaw to carry all the equipment. If we had been asked these questions in the Pennsylvanian, we would quite rightly regard the varanopseids as sensible, progressive folk and the sphenacodonts as hopelessly effete niche players doomed to evolutionary oblivion. .
Where all this is going, in case the reader wondered, is Reisz (1972). This was Prof. Reisz's very first publication, ambitiously titled Pelycosaurian reptiles from the Middle Pennsylvanian of North America. Understand that, at the time, Romer & Price (1940) had intimidated a generation of paleontologists. After one of the greatest paleontologists who has ever lived has written a nearly 600 page treatise on a subject, there is likely to be a pause, hiatus or, if you will, a diastema, before any major revision is undertaken. When it does happen, it is likely to be because someone is young, bright and inexperienced enough to mention that the emperor has forgotten a few items of clothing. At the time, Reisz was not only just starting out, but was a student of Robert Carroll -- in some ways Romer's successor -- who was not that much older (at least from the geriatric perspective of this writer). The reason the reader has been subjected to all this fulsome sycophancy is that I disagree with a great deal of Reisz's analysis and many of his conclusions. Having absolutely no business doing so, there is a certain amount of preparatory apologetic bootlicking and groveling one is forced to do while working up the nerve to explain. With that unpleasantness out of the way, we can proceed. However, the reader is strongly cautioned that (a) the following commentary is probably dead wrong and (b) we are also viewing this paper with the benefit of hindsight and, in particular, Reisz's own extensive studies over the last 30 years. Reisz begins his analysis with two observations which are dubious. First, he states that skull sizes increased as a proportion of body size over time. Even if stratigraphic time were an adequate proxy for evolution, which it isn't, the trend wouldn't hold true in light of the fossil record known today. Second, he speculates that increasing absolute size requires a disproportionate increase in jaw size. The reason is that mouth area increases only as the square of linear dimension, while body volume increases as the third power; and this increase in area "is necessary in order that the larger animal may obtain an equivalent amount of food." How then does he explain the notably microcephalic herbivorous forms? How about mouth volume? Jaw speed and strength? Changes in prey, in metabolism, digestive and reproductive efficiencies? Any of these characteristics can and have been more important to permitting large size than oral surface area. Reisz follows this up by concluding that head size not only increased but that "the antorbital region of the skull becomes relatively longer." This is an artifact of the fact that so many of the data points are ophiacodonts, which are so notably longirostrine that Romer believed them to be aquatic piscivores. Varanopsids, on the one hand, and sphenacodonts, on the other, are both much shorter in the antorbital jaw than ophiacodonts. Archaeothyris, a very early synapsid form, has a short rostrum for an ophiacodont, but a long face for an eothyrid or varanopseid -- about the relative length of a sphenacodont, in fact. Reisz completes his jaw analysis with the mechanics in his Figure 20, reproduced at right. This is Reisz's summary figure on jaw mechanics in early synapsids. The figures have been relabelled for legibility. The original legend has been retained except for the omission of specimen identifications. Hylonomus and Paleothyris are romeriids -- probable primitive amniotes with unfenestrated skulls. Archaeothyris is the more complete of the two Carboniferous synapsids described in Reisz's paper , and Ophiacodon uniformis is a Lower Permian ophiacodontid. Reisz concludes that temporal fenestration developed as a response to the need for more muscle mass because of the decreasing mechanical advantage imposed by lengthening of the preorbital jaw. He analyzes mechanical advantage in the manner set out in the figure, in essence as a third class lever. 1) A jaw cannot be treated as a massless third class lever with a weight at the end. It can be treated as a massless third class lever with a weight at the center of mass. So, Reisz's point D is in the wrong place. We don't know where D' should be, but it will depend on the distribution of mass along the jaw. 2) The third class lever model only works for forces normal (i.e. at 90°) to the lever arm, which is modeled as a straight line between the jaw articulation (A) and the center of mass (D'). This will decrease the actual force applied to moving the jaw by a factor of cos(ø), where ø is the number of degrees by which the force angle differs from the normal. We may omit the math, but this is precisely equivalent to moving point B to a new point (B') towards A resulting in a loss of mechanical advantage by the same factor, i.e. cos(ø). Thus B is also in the wrong place. 3) Because the angle of the jaw is constantly changing, while the muscles pull from the same place (an unrealistic assumption, but remember, this is just a model! ), the mechanical advantage of those muscles is a moving target, depending on the jaw angle (also ø). 4) Just for amusement, remember also that we are opposing the force of gravity. The extent to which gravity reduces the net applied force depends on both the angle of the jaw and the position of the head. So, as with adolescents, we not only need to be concerned with the synapsid's big mouth, but with its attitude. One can see, for example, that the angle of the neck could readily have as decisive an effect as any of the factors mentioned above, even in the ideal model used by Reisz. Ultimately, it seems doubtful that Reisz's model can tell us much about fenestration. Properly considered, perhaps it can tell us something more about jaw design and the division between varanopseids and sphenacodonts discussed above. Except for the dramatically slanted occiput, varanopseids are constructed somewhat along the lines of the various beasts in the model. One might suspect that there were additional mechanical bells and whistles not well represented by the fossil record. For example, examine the braincase of Aerosaurus. Perhaps, for example, some musculature was placed behind the occiput and used some of those great wings on the opisthotic as pulleys to improve both the position (B') and perhaps the angle at which force was directed on the jaw. This would be helpful, but would not dramatically change the basic design parameters discussed above, which also increased B' by moving the jaw musculature further out over the jaw, while keeping a very posterior jaw articulation (A), thus improving the mechanical advantage (AB'/AD'). Sphenacodonts, by contrast, seem to have manipulated D' and ø. The curved jaw, with its massive coronoid and very low articular would have had two interesting effects. First, by counterweighting the anterior jaw, the coronoid moved the center of mass (D') posteriorly, dramatically improving the mechanical advantage. Second, recall that the lever arm is the line between the jaw articulation and the center of mass. If the articular is below the tooth row, ø is actually negative when the mouth is closed. More to the point, the point of maximum advantage (ø = 0 and cos(ø) = 1), is reached before the jaw closes. Thus a sphenacodont's bite would be strongest when it needed to be strong, not when the jaws had already closed. Thus, Reisz's 1972 model is very useful in understanding at least one of the major evolutionary splits of the Carboniferous synapsids, one which we discussed in more general terms above. For whatever reason, selective pressures favored a more efficient jaw in Carboniferous synapsids. Given that this has been true in virtually every lineage since the first gnathostomes, we should not be surprised. One lineage, the varanopseids, accomplished this object by manipulating the position of the jaw, "as if one had kept hold of the animal's braincase and violently pushed the rest of the head toward the chest." The other, the sphenacodonts, changed the shape and mass distribution of the jaw without much changing its position. The latter solution turned out to be "correct" by the only measure we have. We sphenacodonts survived. The varanopseids did not. (ATW 020101). sometimes defined as the last thing one sees before one's head finally disappears up one's cloaca. Back. A somewhat similar case is touched on in connection with the Heterostraci. Back. Reisz's characterization of Archaeothyris as an ophiacodont might be questioned today. Based largely on later work by Reisz himself, we might now think of it as an early mosaic including many -- perhaps mostly -- varanopseid characters. Back. Dilkes & Reisz (1996) [DR96], Modesto et al. (2001) [M+01]; Reisz 1972); Reisz et al. (1997) [R+97], Reisz et al. (1998) [R+98], Romer & Price (1940) [RP40]. Range: Guadalupian to Lopingian of North America, South Africa and Russia. Phylogeny: Varanopseidae: Varanodontinae + *: Mycterosaurus + Elliotsmithia. Characters: $? maxilla with broad dorsal process [M+01*]; $? maxilla contacts prefrontal [M+01*]; $ prefrontal expanded ventrally, leaving only narrow lacrimal in preorbital region [M+01*]; $? lacrimal duct opens laterally, near posterior edge of lacrimal [M+01*]; $ squamosal has a narrow occipital shelf contributing to the occipital surface [M+01*]; $? supraglenoid foramen absent [M+01*]; $? posterodorsal process of squamosal present [M+01*]; $ serrations on marginal teeth [M+01*]. Notes:  Characters marked as [M+01*] were derived by an independent analysis of the data of [M+01] except that (to suit my own prejudices): Elliotsmithia was scored as having a triangular temporal fenestra (char. 9 = 1) as in [R+98]; characters 8 and 24 from [R+98] were used; and characters not applicable to the sauropsid outgroup were treated as gaps, rather than as missing data. The resulting cladogram has the same topology as in [M+01] except that the mycterosaurines are an unresolved trichotomy. $, as always, indicates as synapomorphy. $? indicates a character shown as a synapomorphy in 2 of the 3 equally most parsimonious trees. Links: Geography Arena - Journal Details abstract of [M+01]). Modesto et al. (2001) [M+01]; Reisz et al. 1998) [R+98]. Mycterosaurus: M. longiceps (= Basicranodon). Small, primitive varanopseid. Phylogeny: Mycterosaurinae: Elliotsmithia + *. Introduction: Mycterosaurus longiceps right) is the most primitive member of the family. This small pelycosaur has the typical varanopseid features, but lacks several characteristics of the advanced members of this family. Characters: lacks massive maxillary buttress above canines (plesiomorphic); postfrontal not reduced (plesiomorphic); anterior supratemporal located in groove in parietal [R+98]; temporal fenestra not expanded anteroposteriorly (plesiomorphic); parasphenoid with dentition on ventral plate, extending to part of cultriform process [R+97]; vertebral roughly square in lateral view & deeply amphicoelous [R+97]; (pleuro)centra with well-defined anteroventral recesses for intercentra (not ossified? not recovered?) [R+97]; longitudinal ridge at base of centrum, widening at both ends into abutments for intercentra [R+97]; transverse processes short and horizontal [ R+97]; surface of centrum concave below transverse processes [R+97]; dorsal neural spines rectangular in lateral view, with vertical anterior & posterior edges [R+97]; dorsal neural spines transversely thicker in middle, tapering both anteriorly & posteriorly [R+97]; cervical & dorsal postzygapophyses separated by deep groove [R+97]; postzygapophysis articular facets "tilted slightly medially from the horizontal plane" (??) [R+97]; $ no supraglenoid foramen on scapula [R+97]; posterior coracoid well-ossified in adults and fused to rest of scapulocoracoid [R+97]; $ scapula relatively thin and small, not extending far dorsally; anterior edge of scapular blade slightly S-shaped, thus bent medially above coracoid and laterally above that [R+97]; supinator process is slender and oriented proximo-distally (rather than as a "strongly flared" tubercle -- compare figure at supinator process) [R+97]; femur with slender, gracile shaft [R+97]; femur with S-shaped flexure [R+97]; fourth trochanter absent [R+97]; "internal" = lesser?) trochanter close to femoral condyle [R+97]; femur adductor crest weak or absent [R+97]; femur with popliteal area shallow & broad [R+97]. Links: Biology 356; New Page 1; Geography Arena - Journal Details; Geography Arena - Journal Details. Reisz et al. (1997) [R+97], Reisz et al. 1998) [R+98]. Note:  The sigmoid flexure of the femur leaves an S-shaped crest running down the femur which presumably substitutes for both the 4th trochanter and the adductor ridge. Reisz [R+97] asserts that in all other varanopseids, the skull has been completely reorganized around an anteroposterior expansion of the temporal fossa. ATW030821. Elliotsmithia: very late, South African form. E. longiceps. Range: Late Permian of South Africa. Phylogeny: Mycterosaurinae: Mycterosaurus + *. Characters: prefrontal with abrupt (~80 °!) angle between dorsal & lateral surfaces [R+98]; frontal enters strongly into orbit without distinct flange [R+98]; tapering process of frontal intervenes between anterior parts of parietal & postfrontal [R+98]; pineal opening large [RP40]; pineal foramen raised [R+98]; midline suture of parietals raised [R+98]; parietals with posteroventrally directed occipital shelf [R+98]; prefrontal & maxilla only narrowly separated by lacrimal [M+01]; ventral margin of orbit from maxilla & jugal [RP40]; jugal dorsal process stout, others thin [R+98]; quadratojugal & maxilla exclude jugal from ventral skull margin [R+98]; jugal posterior process meets squamosal and excludes quadratojugal from temporal fenestra [R+98]; postfrontal forms gently curved posterodorsal orbital margin [R+98]; postorbital bar projects laterally [RP40]; postorbital large [R+98]; postorbital ventral ramus meets jugal half-way down temporal fenestra & forms posterodorsal orbit [R+98]; temporal fenestra kidney-shaped [M+01] (contra, [DR96] [R+98]); quadratojugal long, with slender process below jugal [R+98]; postfrontal "unusually elongated posteriorly" [RP40]; long anterior process of squamosal [DR96] [R+98]; squamosal anterodorsal process does not reach jugal [R+98]; squamosal broadly expanded ventrally [M+01]; squamosal with posterodorsal process [M+01]; supratemporal long contact with postorbital & both contact posterodorsal process of squamosal [R+98]; occiput strongly tilted anteriorly [DR96] [R+98]; occiput strongly concave [RP40]; anterior supratemporal located in groove in parietal [R+98]; postparietals paired? [R+98] (could be crushed left postorbital and/or postfrontal? ); $ long, slender paroccipital process of opisthotic [DR96] [R+98] (but see ); supraoccipital boad & plate-like [R+98]; supraoccipital lacks lateral process above temporal fenestra [R+98]; sphenethmoid ("presphenoid" of Romer & Price?) present [R+98]; well-developed pterygoid flanges with single row of large teeth [R+98]; pterygoid palatal ramus with denticles [R+98]; jaw articulation even further posterior of occiput than in Varanops [RP40]; jaw articulation almost on same level as tooth row [RP40]; dentary very long & probably slender [R+98]; mandibular fenestra absent [R+98]; retroarticular process present [R+98]; hyoid elements extending well back behind skull [R+98]; teeth pointed, compressed & recurved [RP40] [R+98]; cutting edges on distal margins of all teeth [M+01]; 1st maxillary tooth caniniform [M+01]; postcanine teth with se cutting edges [M+01]; $ anteriorly inclined neural spine on axis [DR96]; $ dermal ossifications above cervical vertebrae [DR96] [R+98]. Links: Untitled Document; NAPC Abstracts, Ra - Ru. Dilkes & Reisz (1996) [DR96], Modesto et al. (2001) [M+01], Reisz et al. (1998) [R+98], Romer & Price (1940) [RP40]. Notes:  Significance relates to idea that pelycosaurs were restricted to an equatorial belt, a limitation which was not overcome until therapsids evolved. If Elliotsmithia coexisted in Gondwana with therapsids, the latitude limitation may be an artifact. However, as [DR96] point out, the upC-lwP glaciation had receded by the upP in which Elliotsmithia is found. Thus, the hypothesis of severe temperature restriction remains valid. However, it may be as true for therapsids as for their ancestors. This is contained in the diagnosis as an apomorphy; however, the actual description and figure indicate that the process begins at a broad base and tapers slightly ventrolaterally to end at a blunt, unfinished tip and that this is intermediate between the rodlike process of Mycterosaurus and Varanops. 011228. Varanodontinae: Varanodon. defined as Varanodon > Mycterosaurus. Phylogeny: Varanopseidae: Mycterosaurinae + *: Aerosaurus + Varanops. Characters: $ maxilla with dorsal process, but process narrow dorsally [M+01*]; $ lateral buttress of maxilla present [M+01*]; $ lacrimal duct opens laterally on concave surface of lacrimal [M+01*]; $ postorbital posterior process short or absent [M+01*]; $ postorbital excluded from margin of temporal fenestra by jugal and squamosal [M+01*]; $ squamosal contacts jugal on postorbital bar [M+01*]; $ temporal fenestra triangular, not oval [M+01*]; $ anterodorsal process of squamosal present and forms dorsal border of temporal fenestra [M+01*]; $ squamosal occipital shelf absent [M+01*]; $ quadratojugal contributes to margin of temporal fenestra [M+01*]; $ quadrate occipital margin with strong anterodorsal slope [M+01*]; $ supraglenoid foramen present [M+01*]; $ paroccipital process tall, blade-like and attached to tabular [M+01*]. Notes:  Characters marked as [M+01*] were derived by an independent analysis of the data of [M+01] except that (to suit my own prejudices): Elliotsmithia was scored as having a triangular temporal fenestra (char. 9 = 1) as in [R+98]; characters 8 and 24 from [R+98] were used; and characters not applicable to the sauropsid outgroup were treated as gaps, rather than as missing data. The resulting cladogram has the same topology as in [M+01] except that the mycterosaurines are an unresolved trichotomy. All three equally parsimonious trees yielded the same synapomorphies for varanodontines. 020219. Aerosaurus: A. greenleeorum, A. wellesi. Phylogeny: Varanodontinae: Varanops + *. Characters: 1 m & 17 kg [LR81] [RP40]; maxilla long, but not tall [LR81]; lacrimal large and reaches nares [LR81]; "canine buttress" present [LR81]; postorbital posterior process reduced & replaced by expansion of squamosal [DR96]; postfrontal small & restricted to skull table [LR81]; supratemporal included in slot in large parietal [LR81]; anteroposteriorly expanded temporal fenestra [DR96]; lacrimal & jugal exclude maxilla from orbit [LR81]; maxilla & quadratojugal exclude jugal from skull ventral margin [LR81]; quadratojugal included in posteroventral margin of temporal fenestra [DR96]; long anterior process of squamosal [DR96]; squamosal ventral ramus very slender [LR81]; anterodorsal process of squamosal participates in postorbital bar & contacts jugal [DR96]; anteriorly tilted occiput [DR96]; occiput long and gently sloped [LR81]; paroccipital process broad & plate-like [DR96]; supraoccipital with lateral process over temporal fenestrae [R+98]; occipital condyle somewhat flattened [RP40]; braincase not fully fused in mature individual [LR81]; parasphenoid solidly fused to basisphenoid as largest element in braincase [LR81]; parasphenoid overlaps basioccipital & forms ventral margin of fenestra ovalis [LR81]; cristae ventrolaterales large and marked by longitudinal striations [LR81]; $ dorsum sellae primarily from basisphenoid (as in reptiles and ¿mammals?, but not most pelycosaurs) [LR81]; expanded parasphenoid plate with strong, pointed, recurved teeth (!) [LR81]; long laterally splayed basipterygoid processes [LR81]; very long cultriform process [LR81]; pterygoid flanges with single row of large teeth [LR81]; dentary long, overlapping angular & surangular dorsally [LR81]; long splenial extends almost entire tooth row on medial surface (not visible lateraly) [LR81]; internal mandibular fenestra present [R+98]; no reflected lamina [LR81]; only 26 mandibular teeth & 19-22 maxillary [LR81]; teeth longer & flatter than other varanopseids and strongly recurved [LR81]; canines not sharply diffrentiated [LR81]; 5-6 cervical vertebrae & 21-23 dorsals [LR81]; vertebral centra with slight ventral lip, especially cervicals (due to dorsal position of notochordal fossa) [RP40]; sides of cervical centra strongly excavated anteriorly for intercentrum, less strongly excavated in anterior dorsal centra [LR81] [RP40]; crevical vertebrae moderately elongate [RP40]; dorsal centra short [RP40]; neural spines relatively low [LR81]; ribs thin & double-headed [LR81]; gastralia present [LR81]; 70+ caudal vertebrae [LR81]; caudal spines transversely thin [LR81]; supraglenoid foramen "far in advance of the buttress" (??) [RP40]; humerus & femur only slightly longer than epipodials [LR81]; strongly developed deltopectoral crest [LR81] [RP40]; ectepicondylar notch poorly developed (otherwise humerus like Varanops) [LR81]; forearm like Varanops, but shafts straighter & more robust [LR81]; manus phalanges 23453 [LR81]; longitidinal dorsal trough of ilium present (primitive?) [LR81]; femur with ends not greatly expanded [LR81]; tarsals block-like [LR81]; metatarsals and phalanges short & robust [LR81]; pes phalanges 23454 [LR81]. Dilkes & Reisz (1996) [DR96], Langston & Reisz (1981) [LR81], Reisz et al. (1998) [R+98], Romer & Price (1940) [RP40]. Phylogeny: Varanodontinae: Aerosaurus + *. Characters: small (115 cm, 22kg); cranial: premaxilla short [RP40]; maxilla reaches quadratojugal [RP40]; lacrimals with large orbital exposure and reach nares [RP40]; canine "buttress" present [RP40] (even though canines are poorly developed! ); frontals participate in orbit [RP40]; large pineal fenestra well back on parietals [RP40]; unpaired postparietal? [RP40]; orbits strongly frontated [RP40]; jugal with small orbital exposure & does not reach lacrimal [RP40] contradicted by their own figure! ); postorbital posterior process reduced & replaced by expansion of squamosal [DR96] (contra [RP40]); anteroposteriorly expanded temporal fenestra [DR96]; quadratojugal included in posteroventral margin of temporal fenestra [DR96]; long anterior process of squamosal [DR96]; anterodorsal process of squamosal participates in postorbital bar & contacts jugal (??!) [DR96]; quadrate very large and extends far anteriorly [RP40]; anteriorly tilted occiput [DR96]; paroccipital process broad & plate-like [DR96] [RP40]; paroccipital process curves sharply backward (occiput strongly concave) [RP40]; presphenoid present [RP40]; lateral pterygoid flanges weak and far posterior [RP40]; interpterygoid vacuities narrow [RP40]; "inwardly turned ventral flange" on quadrate ramus of pterygoid [RP40]; posterior processes of parasphenoid bridged by bone (also in e.g., Haptodus) [RP40]; intramandibular fenestra may have been present [RP40] [R+98]; well-developed retroarticular process [RP40]; articular surface horizontal [RP40]; dental: tooth row extremely long [RP40]; teeth circular in cross-section and not compressed (?! could be juvenile feature) [RP40]; ~6 "incisors" premaxillary teeth?) & 37-38 maxillary teeth [RP40]; possible pair of posteriorly displaced canines [RP40]; but ~11 precanine maxillary teeth [RP40]; axial: 27 presacral vertebrae, 2 sacrals & 50+ caudals [RP40]; all centra short, with cervicals slightly elongated [RP40]; cervicals with ventral keel [RP40]; anterior centra with slight ventral lip intercentrum articulation?) [RP40]; centra lateral concavities absent [RP40]; intercentra present [RP40]; 2-headed dorsal ribs [RP40]; gastralia present [RP40]; neural spines "of moderate height" [RP40]; neural arches excavated laterally above transverse processes [RP40]; posterior dorsal spines shorter anteroposteriorly [LR81]; body slender (from shape of ribs) [RP40]; 12 caudals with ribs [RP40]; chevrons strongly developed [RP40]; appendicular: short interclavicle present [RP40]; scapula short & not expanded dorsally [RP40]; supraglenoid present, but "far forward on the scapular blade" [RP40]; humerus shorter than femur, but more distal limb bones about equal [RP40]; lesser trochanter moderately high [RP40]; 4th trochanter poorly developed [RP40]; all feet are very long, with hind feet being stouter [RP40]. Note:  [RP40] point out that all of the material known then (and today?) was from a group of juveniles. This may have serious consequences for our understanding of the both the genus and the family of which it is the type & best-known species. It becomes obvious, after reading many descriptions, that the ventral marginal skull bones of varanopseids are very long, fragile things, easily subject to both breakage and distortion. Descriptions of the posterior maxilla, jugal, quadratojugal, etc. should therefore be taken with a considerable dose of caution. The anatomical conclusion of [RP40] is worth noting: "crudely put, the head is essentially that of a primitive pelycosaur [i.e., to Romer, an ophiacodont] the trunk and limbs those of a sphenacodont ... . [Varanops' specializations are in the jaw which appears] as if one had kept hold of the animal's braincase and violently pushed the rest of the head toward the chest." Note that certain elements in the image from [RP40] are not consistent between the dorsal and lateral views. In particular, the size and position of the lacrimal cannot be reconciled. Equally troubling is the figured squamosal which, according to [DR96] reaches the jugal in the postorbital bar with a long anterodorsal process -- plainly missing in the figure. 011228.